Lance canines (aka mesioversion) is an orthodontic abnormality in which the upper canine teeth are pointed more forward than normal. It occurs on one or both upper canine teeth. Lance canines are most commonly seen in Shetland Sheepdogs (Shelties) but can occur in other dog breeds and cats. Sometimes, the abnormal positioning is cosmetic only and does not require correction. However, in many cases the orthodontic misdirection leads to problems with bite function or lip position, and correction is warranted. For example, when the upper canine points forward, the normal interdental gap between it and the third incisor collapses. Then the lower canine tooth cannot fit in its normal position between these upper teeth. The lower canine must deviate either labially (outward toward the lip) or lingually (inward toward the tongue). Possible problems include painful traumatic contact with the hard palate, tooth-on-tooth wear, and irregular contact with the lip. These secondary outcomes can often be more difficult to treat than the original problem. Treatment options for lance canine depend on the severity of the condition and the pet owner’s commitment to treatment. Orthodontic movement of the lance canine can be a realistic option using a device similar to human braces. The function and cosmetic appearance of the tooth is maintained without any oral surgery. If orthodontic therapy is not an option, extraction or crown height reduction (with vital pulp therapy) may also be considered. The cause of lance canines is likely inherited. At the present time, there is no firm evidence this malocclusion is hereditary; however, it can be deduced from the high representation of Shelties with lance canines. 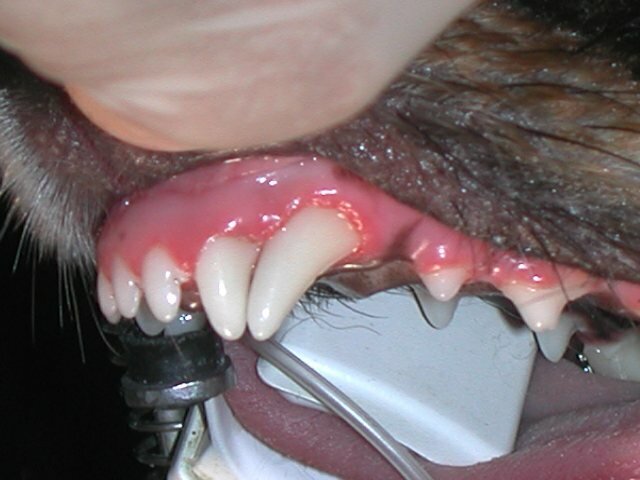 In some cases the malpositioned canines actually result from persistence of deciduous (baby) canine teeth, i.e. if the deciduous teeth do not exfoliate in a timely manner they deflect the erupting adult teeth into an abnormal orientation. Affected animals should not be used for breeding purposes when an inherited cause is suspected. In general, the same pairing that resulted in the pet with the malocclusion should be avoided once again. A study is currently underway at the University of Missouri to develop a DNA screening test.